So you made it. It’s time to get your first pair of pointe shoes. But with so many options, how do you choose? For starters, don’t make the mistake of just choosing a random shoe based on the name or word of mouth. Your pointe shoe will have a major impact on you as a dancer, and choosing the right shoe takes careful consideration. Below you’ll find a guide for choosing the right pointe shoe, but always make sure to go to a specialty store to double check the fitting. The simplest place to start for your pointe shoe fitting is understanding your foot type and how that will translate to your pointe shoe. Here are the different areas of your pointe shoe that are impacted by your foot type. But now comes the question of how your foot affects these different areas. Below you’ll find a quick diagram showing how your foot type will impact the type of pointe shoe that you choose. 1. It lets you be the best dancer you can be without constantly worrying about your shoes. 2. The right pointe shoe will help to protect the delicate parts of your foot, which includes your toes and toenails. It will also limit certain bad habits that can lead to injury. 3. It will follow closely to the contours of your foot, providing support in the shank and box, and help to compliment your lines. 1. Pain, toe bruising, and even bunions. 2. Twist in the shank. 5. Affect form such as sickle or pronated stance. Do you remember that fancy image we showed earlier? Well, your box type is going to depend on your toe shape and width, the length of your toes, the degree of compression and your foot profile height. Keep in mind that the Box Shape is one of the most important parts of pointe shoe fit. Choosing the wrong box shape can lead to pain in your toes, bruising, and all of those bad things we mentioned earlier. The goal here is to choose the box shape that follows the shape of your toes the closest. Now, that you’re looking for box shapes from manufacturers, you may be tempted to start going off of reviews and recommendations. Don’t! What does matching your toes mean? Fit to the pointed foot, do not curl your toes. Use the images below to match your toes to the right box shape. Things can get tricky as you determine what kind of feet you have Egyptian feet, Greek toes, Giselle, etc. Even if your toes aren’t a perfect match for the diagrams above don’t worry! Some dancers have a combination of different toe types, and these can even be different on each foot! Vamp Length is another important part of getting the right pointe shoe fit. Using a vamp that’s too long will make it more difficult to get over the vox, and a vamp that’s too short won’t give you enough support. Using a vamp that’s too short will result in you possibly rolling over your shoe. A foot that can easily compress is more likely to conform to the shape of your pointe shoe. So, depending on the level of compression, your foot may expand vertically if the shoe is narrow in width. This means you may need extra support from the vamp. Using a longer vamp can help your feet feel more secure in their shoes. Pointe shoe width is one of those things that is just too difficult to predict. The best way to find the right shoe based on width is to be fitted by a professional. However, if you’d like to learn more about pointe shoe width, then there are some interesting facts. If you’re not getting enough support from your shoe with the correct box shape and vamp length, then you can try upping the length and going down the width (or vice-versa) until you find the right fit. If you go too wide, then the metatarsal won’t have enough support, which causes you to sink down into your shoe with all the weight on your big toes (ouch!). If your pointe shoe is too narrow, then you can start to lose feeling in your feet over time (not good). Too narrow of a shoe can also result in the shank twisting off center (see image below). Because every dancer’s feet will react differently to compression, finding the right fit for width isn’t as easy as you’d think. Try squeezing the sides of your feet where bunions form, what happened? If your foot moves a lot, then that means it will also expand vertically. This impacts something called your foot profile height. All pointe shoe manufacturers have varying width options, but they won’t all offer the same choices. Because of the vast differences in dancers feet, pointe shoes vary from extra narrow to extra wide. Long slender tapered feet, or highly compressible. In between, may take narrow or wide shoes in different brands. Could be a foot that appears medium but compresses slightly. In between, may take medium or wide width in different brands. Toe shape does not determine width. Wide is possible in Egyptian style feet too! A thicker foot or flat foot may take an extra wide width. We mentioned how profile height is impacted by your degree of compression, and this is an important aspect of your pointe shoe fit. Now, finding the pointe shoe with the perfect profile height will take some trial and error (unless you get fitted by a professional). Here’s a trick to find your profile height. See if you can fit a finger or two into the throat of your shoe if you can then the profile should be lower. The throat of your pointe shoe should be snug against the top of your foot. When your shoe fits correctly you should not be able to move your toes very much. Tip: During the break-in process, be careful stepping on the box to flatten the shoe. This can cause the shoe to get up to a 1/2 inch wider. This can cause problems for dancers with compressible feet. 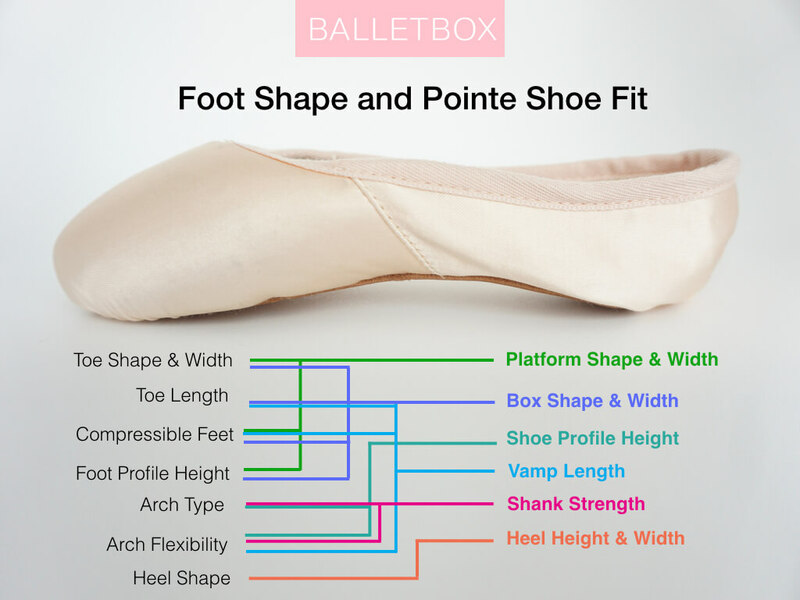 Even if a pointe shoe checks all the right boxes, the profile height can still be a deal breaker. If the profile height is too high, then you can still experience pain in your foot. Shank strength is a preference for experienced dancers, but highly specific for beginners. Finding the right shank strength for your pointe shoe is determined by several difference factors such as arch, foot strength, height/weight, and preferences. Always choose shoe shank strength based on what compliments you as a dancer, and not what your school requires. Sometimes it can take trial and error to find the right shank strength, and don’t be surprised if your preference in shank changes over time. Some notes on shank strength: Some instructors prefer beginner pointe students to use soft shanks to help strengthen your feet, others prefer harder shanks to help you get on pointe and build strength from the resistance of the shoe. Both methods help dancers build strength, but can be frustrating because a softer shank will make it difficult to roll through pointe, and a hard shank will make it difficult to get over the box. The wrong shank will cause problems. Make sure to choose the right shank for your arch type and even consider pre-arched options depending on your foot. Pre-arched pointe shoes can be great for dancers with high arches, and you may find that they last longer because there is less strain during the break-in process. Choosing the right heel shape depends on the shape of your heel while standing flat and on pointe. Most manufacturers use an average “medium” heel height, but do offer extra low or deep heels. The size of the heel is not the most important aspect of your pointe shoe fit. Keep in mind that you don’t want more than 1/4-1/2 inch of extra fabric at your heel while you’re on pointe. A baggy heel will ruin the line from your toes to the rest of your leg. If you heel digs into your Achilles, then your heel may be too high or low. Note: Disappearing heels are heels that diminish greatly while on full pointe or relive. If you have this type of heel, then you should choose a pointe shoe with a low or tapered heel. How “special” are special features? Personal preference is huge when it comes to “special” features. While most dancers don’t need these different options, some choose them for additional comfort and durability. Here are a couple of special features that you’ll come across when looking for your pointe shoes. Ok. So not exactly “space-age”, but different companies will offer pointe shoes made out of modern materials that are supposed to have more support, durability or comfort. Gaynor Minden is one of the vendors that will frequently come up with new materials for pointe shoes such as fabric, special glue, or plastics. Different pointe shoe manufacturers will offer shoes made from different linings that may be more durable, odor resistant, or fight bacteria. Using pre-arched shanks are great options for ballet dancers with a flat or low arch. This is a special feature offered by different pointe shoe brands.